We interrupt our regularly scheduled programming and all meaningful and timely topics to bring you the latest news on the ever-growing dreaded “Haskin Curse” that has quietly plagued the Sport of Kings for well more than a decade. For years, I have made numerous references to the racing gods and their main servants of sin, the Derby gods. Yes, there are deities out there who often take it upon themselves to alter the course of racing history by utilizing all kinds of devious methods. However, never, as a mere journalist, would I have imagined that I would be the target of these divine entities. Let this column also serve as a warning to all Thoroughbred owners, that under no circumstances should you even contemplate naming a horse after yours truly or any member of his family, for you surely will incur the wrath of the racing gods and ill fortune will befall you. Let's go back to 2003 when owner/breeder and self-made billionaire Dan Borislow, with whom my wife and I had become good friends, had a brief brain lapse and named one of his homebred 2-year-olds Haskin's Hope. Little did he know how potent the witches’ brew was that he was concocting. The son of Aggressive Chief would make the Haskin family history books by becoming the only sloth-like steed named for a member of the family to even make it into a starting gate. In four career starts at Laurel, Colonial Downs, and Philadelphia Park, Haskin's Hope finished ninth, sixth, 12th (in an $8,000 claimer) and eighth (for a $14,000 claiming tag) before disappearing into oblivion. If only we had horse rescue organizations back then I would have tried my best to find poor Haskin’s Hope a good home. The one positive note to come from the infamous Haskin's Hope affair was knowing that would be the end of naming horses after me. That is until 2008 when none other than Bob Baffert had the horrible idea of naming one of his own horses just plain old Haskin. Clearly, he was unaware of the Haskin’s Hope saga and family history he was about to tamper with. So it was, that Baffert put the hex on an unfortunate colt by Perfect Soul by giving it a name that for years had become widely known throughout the streets of Bensonhurst, Brooklyn for its infamous nature. Whenever my parents returned home with a package or box, the residents of 64th Street would immediately gather in our alley to see what we got stuck with this time. One day, someone committed a cowardly act of vandalism by painting a lemon on our front door. You could say Murphy’s Law was instilled in me at an early age. With the equine Haskin, it was just a matter of waiting to see what kind of lemon Baffert stuck himself with. Word of the “Haskin Curse” must have gotten to him pretty quickly, because it didn’t take the eagle-eyed trainer long to realize that Haskin could barely outrun his namesake. But he was useful enough as a workmate for other horses. So Baffert, taking pity on yours truly, actually changed the colt’s name to Workmate. Just like that, Haskin was no more, wiped clean off the pages of The Jockey Club. But that wasn’t the end of the Workmate/Haskin saga. During the casting of the movie Secretariat, someone in the know told Baffert that Workmate/formerly Haskin was the spitting image of Secretariat and that he should send him East to audition for the role of Big Red. Finally, it was my big chance to make it in the movies and to play arguably the greatest horse that ever lived. That would be a better story than winning a stakes race. But by the time Baffert got around to making shipping arrangements and was ready to put the horse on the plane, he was informed by the wrangler that the roles had all been cast. So, Haskin now had the dubious distinction of blowing two careers before his actual third birthday. OK, so my one-time namesake was no Brando. Baffert said he gave Workmate away as a riding horse, but he somehow wound up back on the racetrack, racing 15 times at Turf Paradise and then Canterbury Downs from 2009 to 2011. He did win five races, starting off his career running for a $30,000 claiming tag and then gradually dropping down as low as $2,500. He was claimed twice, for $3,500 and $5,000, concluding his career with a ninth-place finish at Canterbury downs on our daughter’s 27th birthday. He was owned at the time by Rodney Miller, and although you always fear the worst, I can only hope he eventually did wind up as a riding horse or at least was given a good home. So, the one-time Haskin and near Secretariat double finally did become a winner, but under a different name. Now comes 2013, or maybe it was 2012, and Ahmed Zayat tells me he wants to name a horse after me. Is he insane? Doesn’t he realize he’d have a better chance ending the Apollo Curse than the Haskin Curse? Not only did the Zayats name a filly Amanda Devi, they gave the name to a daughter of their stallion, the speedy grade I-placed Maimonides. It just so happened that I was born in Maimonides Hospital in Brooklyn. That’s it; the curse is going to be broken. I could see the headlines now, “Amanda Devi Captures Alabama Stakes.” That would be a thousand times more satisfying than a horse with my family name. Maybe I could sneak this one past the racing gods. Time passed and I didn’t give it much thought until I was visiting Kentucky Derby winner Orb at the Fair Hill Equine Therapy center. While casually looking over the board listing the center’s current residents, I came across the name Amanda Davi. What, my filly is here undergoing rehab and her name is spelled wrong? What’s a Davi? I was told that she was one of the favorites there, how everyone had fallen in love with her. She had been with trainer Rudy Rodriguez, but suffered a bone chip and had to have it removed. She was doing fine, and it was a joy seeing her and having several photos taken with her, even though her name was spelled wrong. She had the sweetest disposition and I could see why everyone loved her. I later informed Justin Zayat that they got the name wrong, and to his credit he contacted The Jockey Club and changed it to Amanda Devi. After recovering, she was sent to Dale Romans. The following spring she finally was entered at Churchill Downs on the Wednesday before the Kentucky Derby. Not only was I going to see her debut in person I would surprise my daughter by framing the win photo for her. This was meant to be. But when the horses came into the paddock, there was no sign of Amanda Devi. Where is she? I found out she had been a late scratch, and when I asked Romans about it, he said she had been perfect with no problems…until that morning. I was so disappointed I couldn’t remember if he said it was a fever or a filling. It didn’t matter. I knew deep down it was the curse at work again. The months passed and no Amanda Devi. I stopped inquiring about her, because at that point I knew that whatever was behind the curse was never going to let her run. The next thing I heard about her was that she had been retired and bred to Paynter. OK, I’ll wait for her baby. The Zayats seemed high on her as a broodmare prospect…or so I thought. The following year I found out she had been consigned to the Keeneland November Bloodstock sale, where she was sold in foal to Paynter for a paltry $10,000 to Mersad Metanovic Bloodstock. Like Workmate/Haskin and Haskin’s Hope, I can only wish the best for her and hope she at least has a happy life wherever she may be (I have made inquiries). That’s it. No more names. So, what happens? Last year I was informed by my good friend, two-time Kentucky Derby-wining owner Paul Reddam, that one of his trainers, Ben Cecil, had a Union Rags colt he was high on and asked Reddam to give him a short snappy name like Nyquist. What name does he come up with? 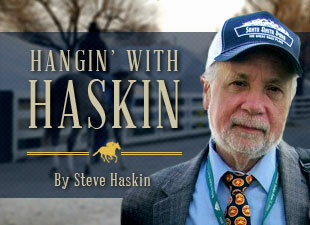 You guessed it…Haskin had been reborn. I didn’t even have a chance to warn him and Cecil of the consequences of that decision and the bad luck that likely would befall them. Like my parents, they were about to open up one of those dreaded packages. What misfortune would await them this time? I followed the new Haskin through months of workouts, many of them plodding five-furlong saunters in 1:04 and change and 1:05 and change. Not exactly a surprise. But Cecil told Reddam he was waiting for two turns, and those works gave way to a couple of decent works. Finally Haskin was entered in a 1 1/16-mile race around Christmas time. He was sound, he was ready, and nothing could stop him from actually getting in the starting gate. Finally, the name Haskin would be blaring out of the announcer’s booth. Silly me. When was I going to learn? A total of 14 horses were entered, with two also-eligibles. And who do you think drew post 14 on the also-eligible list and failed to get in? The Haskin name had been silenced yet again. A maiden race at that distance is rare and he likely was not going to find another opportunity like this one. But this Monday, Cecil had him back in the entries again, this time in a two-turn one-mile race. Once again, the race overfilled with 11 horses and one also-eligible. Care to guess who that one also-eligible was? Not only that, but poor Haskin was the only also-eligible on the entire card. So, once again, he failed to get in and had to stay in the barn while the others attempted to embark on the Kentucky Derby trail. And who won that race in an uninspiring four-horse blanket finish in slow time? Of course, the original Haskin owner Bob Baffert. This second also-eligible scratch finally has made me come to terms with the Haskin Curse, or I should say come to peace with it. I just feel sorry for all these innocent steeds over the years who had the misfortune of being plagued by the curse. Not to mention all the misguided owners who put the whammy on their own horse. Because of that I have never had any quests of grandeur when it has come to the family name and horses. I used to be sentimental about it, but I’ve grown as hard as my mother’s matzoh balls. Up until the day she died, she talked about her bad luck in life, even though she was 92 at the time. I never aspired to have a Kentucky Derby winner named after me like a current Swedish-born hockey player. I never aspired to have a Breeders’ Cup Classic winner named after me like a certain New York freelance journalist. And I never aspired to have one of the greatest horses of all time named after me like a noted Boston neurosurgeon. Right now I’d be happy just to get a horse in the damn starting gate.